This Renaissance religious tapestry "Pieta" shows the work of Giovanni Bellini. Here we see the crucified Christ with Mary and St John the Baptist. Bellini was an Italian Renaissance painter (1430-1516) and had a style that was all his own. His works included many religious subjects and saints and are now in their original churches as well as art galleries over the world. 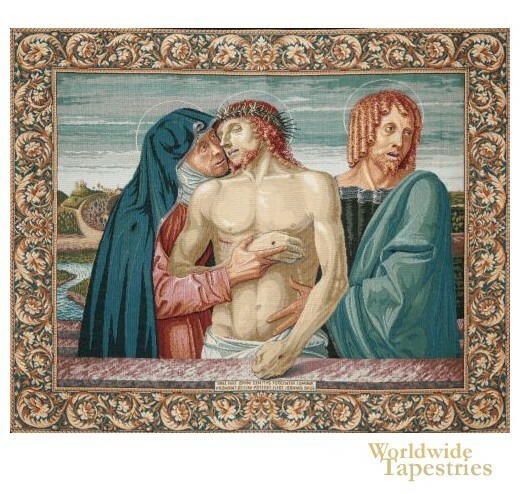 This religious art tapestry "Pieta" is lined and has a tunnel for easy hanging. Dimensions: W 25" x H 20"